It feels like every week we are writing about a wide receiver who loves to burn the Eagles. 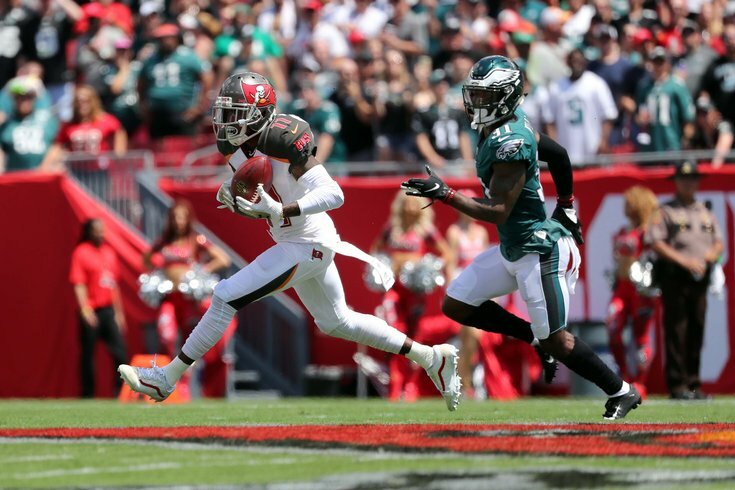 A week after Julio Jones torched Philly, albeit in a loss, for 169 yards their old friend DeSean Jackson went off immediately, sprinting 75 yards for a touchdown for the first play from scrimmage with the Buccaneers hosting the Week 2 contest. Quiet until the third quarter, a 28-yard catch on the sideline set up a four-yard touchdown toss to Mike Evans — Fitzpatrick's fourth of the game. His final catch was arguably almost as important as his first, a 17-yard catch for a first down in the fourth quarter with the Eagles defense trying to get off the field and mount a final comeback. In all, Jackson caught four passes for 129 yards and a score to highlight Fitzmagic's big day in their 27-21 win in Week 2. O.J. Howard also got in the mix with his own 75-yard scoring strike a quarter later. Jackson, of course, was a fan favorite and lightning rod for the Eagles' offense when he first entered the league. He was unceremoniously cut after Chip Kelly's first season and has relished the chance to go up against his old team since, even after he outlasted Kelly's NFL tenure. Remember when DeSean used to do that when he played for the Eagles, but Chip Kelly cut him because he didn't like him? Memories. Jackson is looking more and more like an NFL hall of famer, and has the second most 50-plus yard catches in league history. Jackson is 5-1 against the Eagles, with the first five games coming as a member of the Redskins — he didn't face them last year with the Bucs. Jackson's five-game winning streak was preserved despite a furious Eagles' comeback attempt, as Philly trailed by 13 points inside five minutes to go Sunday. A rainbow toss to the corner of the end zone got the Eagles within six points but two big first downs by Fitzpatrick (adding to his 405 yards passing on the day) didn't give the road team a realistic chance to try and complete the comeback. Perhaps fantasy football owners of T.Y. Hilton should assume the best for Week 3, when the Colts come to town and the Eagles inconsistent secondary tries to shut down a star receiver for the first time this year.